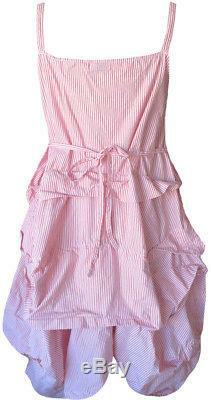 Versatile Umbrella Slip by Krista Larson constructed from pink and white striped medium-weight cotton. A-line silhouette that falls to mid-calf; wide horizontal pleats under an "umbrella" top fold that falls at belly level; side ties to adjust fit; shoulder straps shortened to 9 front to back. Classic Krista layering slip -- or wear it as a sundress if you dare! The item "Krista Larson Pink/White Striped Cotton Umbrella Slip Romantic Vintage Style" is in sale since Monday, March 26, 2018. This item is in the category "Clothing, Shoes & Accessories\Women's Clothing\Dresses".